This seems to really help with him not getting burnt out on any one subject. As a “reluctant reader,” I have found that the combination of audiobook & book works so great!! Especially when they are books about Babe Ruth– he finished it within 1.5 days. We take turns with just-for-fun reads and classic literature. The old-school “Schoolhouse Rock” — I love it!! We have already covered local/state/federal government, reading maps, Nouns, Math rounding, and Nutrition (myplate). He had a blast with the nutrition!! We even threw in a weekend of having his best guy friend over for some “socialization.” We’ve been doing a lot of character study which has included proper interaction with friends and proper communication techniques when you are angry so I thought having someone over would be a really great chance for him to practice it. He did great! We have so much fun during football season. The kid is the perfect age. It’s probably the only time all year that we all want to watch the same t.v. station. 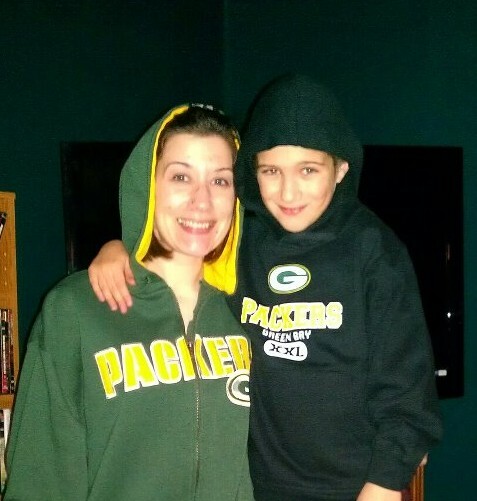 As silly as it seems, our family– even though the other member is not a Packers fan– becomes closer during football. Me: What did you do wrong that the cops are chasing you? Me: You’ll never take us alive!!!!! I didn’t get my motivational posters or anything hung up yet, but this is a pretty great start for Day 1 !! He was super excited about his own workspace!